As our workplaces become more and more technology-oriented, conference rooms and meeting spaces are becoming much more complex than just a table surrounded by some chairs with a phone in the center. Many of these rooms are now outfitted with a large display on the wall and places in the wall or at the table for a user to plug in their laptop to present to the display. Some rooms are also getting video conferencing capabilities, which adds a video conferencing codec and one or more cameras to the room’s system. If the room is big enough, it may require microphones for the participants in the room or those on the other end of the video call to hear the presenter. However, I come to you with good news – there is an easier way. At Camera Corner, we have a team of software engineers who are AV control system programmers. My team members and I take only the buttons you need and create a custom interface that makes more sense and simplifies your meeting or presentation. The functions from multiple different remotes get put onto one control surface, typically a touch panel or button panel. This control surface gets mounted in the wall or on a lectern or table where it won’t get lost or walked away with. We can also make one button on the touch panel do multiple steps automatically. For example, instead of having to press six different buttons to get everything in the room turned on and set up the way you need it for your meeting, we could roll all of those separate actions into a single “Start Meeting” button. This type of approach makes the technology in the room less intimidating for users, especially those who aren’t as technologically confident. It also can reduce the amount of calls to the company service desk or IT staff because someone who was too confident started messing with buttons on the remotes that they shouldn’t. Control systems can be as simple as a two-button controller, or as complex as a large touch panel that can flip between many different pages of controls. They can be installed in spaces as small as huddle rooms, or as large as auditoriums and theaters. The equipment can be self-contained in a single space, or it can be interconnected with other rooms across the entire building. We can help figure out what will work best for your company and the space in question. When considering a technology update, talk with one of our AV account managers about how a custom control system could benefit you! Emily graduated from St. Norbert College, where she studied computer programming. 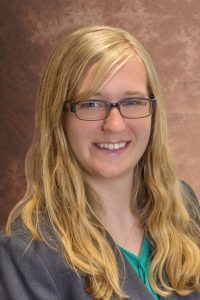 While working for Thrivent Financial, Emily volunteered at the Green Bay Community Church, during which time she worked mostly with Camera Corner A/V equipment. It was at the Green Bay Community Church where she met Scott Tomashek, who encouraged her to join the Camera Corner Connecting Point team. Emily was born in Marinette, WI, and moved to the Green Bay area for college. Her brother recently started college in Eau Claire. She met her husband, a UW-Green Bay graduate, in Green Bay and they married in 2016. While they do not currently have any pets, they look forward to getting a dog once they have a place with a fenced-in yard. While in college, Emily also studied music, and enjoys playing a variety of instruments–especially the oboe. She also enjoys working with graphic design and video production.